IBM Watson is a cognitive computing platform that you can use to add intelligence and natural language analysis to your own applications. Watson employs natural language processing, hypothesis generation, and dynamic learning to deliver solutions for natural language question and answer services, sentiment analysis, relationship extration, concept expansion, and language/translation services. ..and, it is available for you to check out with IBM Bluemix cloud services. Watson won Jeopardy, tackles genetics, creates recipes, and so much more. It is breaking new ground on a daily basis. The IBM Watson™ Question Answer (QA) service provides an API that give you the power of the IBM Watson cognitive computing system. With this service, you can connect to Watson, pose questions in natural language, and receive responses that you can use within your application. In this post, I’ve hooked the Watson QA node.js starter project to the Web Speech API speech recognition and speech synthesis APIs. Using these APIs, you can now have a conversation with Watson. Ask any question about healthcare, and see what watson has to say. Check out the video below to see it in action. Just click on the microphone button, allow access to the system mic, and start talking. Just a warning, lots of background noise might interfere with the API’s ability to recognize & generate a meaningful transcript. This demo only supports Google Chrome only at the time of writing. You can check out where Web Speech is supported at caniuse.com. This demo uses the Watson For Healthcare data set, which contains information from HealthFinder.gov, the CDC, National Hear Lung, and Blood Institute, National Institute of Arthritis and Musculoskeletal and Skin Diseases, National Institute of Diabetes and Digestive and Kidney Diseases, National Institute of Neurological Disorders and Stroke, and Cancer.gov. Just know that this is a beta service/data set – implementing Watson for your own enterprise solutions requires system training and algorithm development for Watson to be able to understand your data. What is the treatment for X? What are the symptoms of X? Am I at risk of X? What should I expect before X? What should I expect after X? Why do I need to get shots? What should I do if my child is obese? Hooking into the Web Speech API is just as easy (assuming you’re using a browser that implements the Web Speech API – I built this demo using Chrome on OS X). On the client side, you just need need to create a SpeechRecognition instance, and add the appropriate event handlers. To make your app talk back to you (synthesize speech), you just need to create a new SpeechSynthesisUtterance object, and pass it into the window.speechSynthesis.speak() function. You can add event listeners to handle speech events, if needed. Check out these articles on HTML5Rocks.com for more detail on Speech Recognition and Speech Synthesis. Historically, most people think that Worklight is just for creating hybrid mobile (HTML-powered) applications. While this is one of the powerful workflows that Worklight enables, it’s also the proverbial “tip of the iceberg”. Worklight does a lot more than just provide the foundation for secure hybrid applications. Worklight also provides a secure foundation for native applications, and can be easily incorporated to any existing (or new) native app. In this post, I’ve put together a video series to take a look at just how easy it is to setup Worklight in an existing iOS native application to provide remote log collection, application management, and more. Read on for complete detail, or check out the complete multi-video playlist here. The existing app that I’ll be integrating is based on an open source Hacker News client, which I downloaded from GitHub. Check out the video below for a quick introduction to what we’ll be building. If you want, you can leverage the Worklight IDE – a set of developer tools built on top of the Eclipse development environment. If you don’t want to use Eclipse, that’s OK too – Worklight can be installed and configured using the Worklight command line interface (CLI) and you can leverage any developer tools that you’d like to build your applications. Want to tie into Xcode ? No problem. I’ll be using the Worklight CLI to setup the development environment in this series. The Worklight server is the backbone for providing Worklight features. App managment, remote logging, operational & network analtics, and all of the Worklight features require the server, so the first thing that you need to do is setup the server for our environment. Check out the next video, which will guide you through setting up a Worklight server/project using the CLI. First things first, you have to start the Worklight server. If you haven’t already configured a Worklight server, run the create-server command to perform the initial setup – this only has to be run once ever. Next, go into the newly created project directory and go ahead and start it. You will be prompted for an API name. This can be anything, but you should probably give it a meaningful name that identifies what the API will be used for. 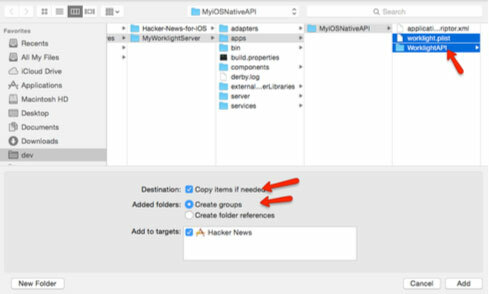 In this walkthrough I specify the name “MyiOSNativeAPI”. 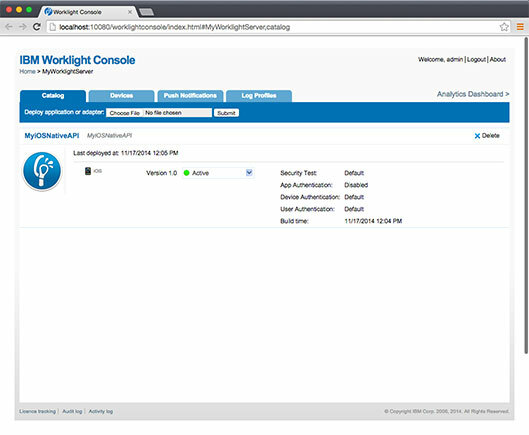 Next, launch the Worklight console to view that the project has been deployed and the native API has been created. The console will launch in the system web browser. Be sure to check out the Worklight CLI documentation for complete detail on the CLI commands. 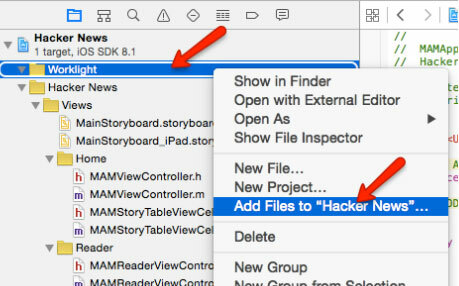 Next, navigate to the newly created MyiOSNativeAPI folder and select the worklight.plist file and WorklightAPI folder, and click the “Add” button. Next, In the Xcode project’s Build Settings search for “Other Linker Flags” and add the following linker flag: “-ObjC”. Next, go ahead and launch the app in the iOS Simulator. You’re now connected to the Worklight server! 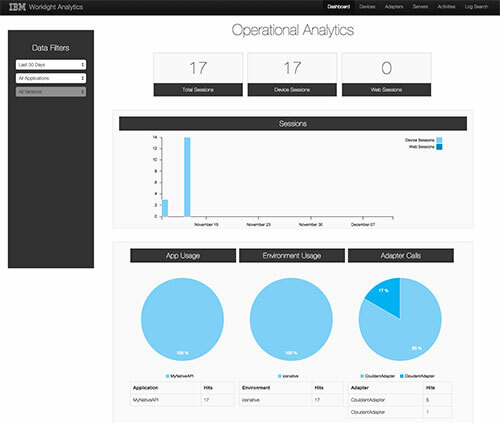 At this point, you could leverage app management and analytics through the Worklight Console, or start introducing the OCLogger class to capture client side logging on the server. Once you’re connected to Worklight, you can start taking advantage of any features of the client or server side APIs. In this next video, we’ll walk through the process of adding remote collection of client app logs, which could be used for app instrumentation, or for debugging issues on remote devices. On the server, you’ll need to add log profiles to enable the capture of information from the client machines. On the client-side, we just need to use the OCLogger class to make logging statements. These statements will be output in the Xcode console for local debugging purposes. If a log profile has been configured on the server, these statements will also be sent to the Worklight server. For complete reference on client side logging, be sure to review the Client-side log capture API documentation. Out of the box, Worklight also provides for hassle-free (and code-free) app management. This enables you to set notifications for Worklight client apps and disable apps (cutting off access to services and providing update URLs, etc..). This next video walks you through the basics of app management. 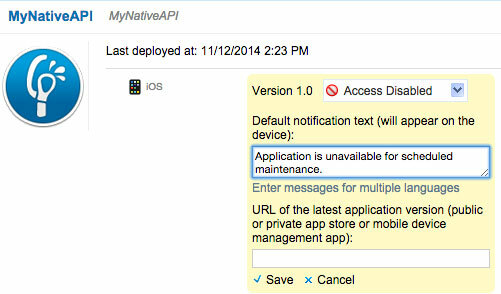 Be sure to check out the complete documentation for app management for complete details. At this point, we’ve now successfully implemented Worklight server integration into a native iOS app. We have remote collection of client-side logs, we can leverage app management, and we can collect operational analytics (including platforms, active devices, and much more). If you don’t want to leverage any more Worklight features, then by all means, ship it! However, Worklight still has a LOT more to offer. In the next two videos we will walk through the process of collecting information inside the native iOS application and pushing that into a Cloudant NoSQL data base (host via IBM Bluemix services). Cloudant databases have a REST API of their own, so why use a Worklight Adapter? For starters, Worklight becomes your mobile gateway. By funneling requests through Worklight, you are able to capture analytic data for every server invocation, and Worklight gives us the ability to control access to the enterprise. Worklight gives you the capability to cut off mobile access to the backend at any time, just by changing the API status. Once the data adapter has been configured, it is simple to invoke the adapter procedures to get data into or out of the your applications. IBM MobileFirst Foundation (aka Worklight) is for more than just hybrid app development. It is a secure platform to streamline your enterprise application development processes, including everything from encryption, security and authentication, to operational analytics and logging, to push notifications, and much more, regardless of whether you’re targeting hybrid app development paradigms, or native iOS, native Android, or native Windows Phone projects.